Areej Masoud, a Christian Syriac Orthodox Palestinian born in Bethlehem who currently works as the Development & Communications Department Coordinator at Bethlehem Bible College. 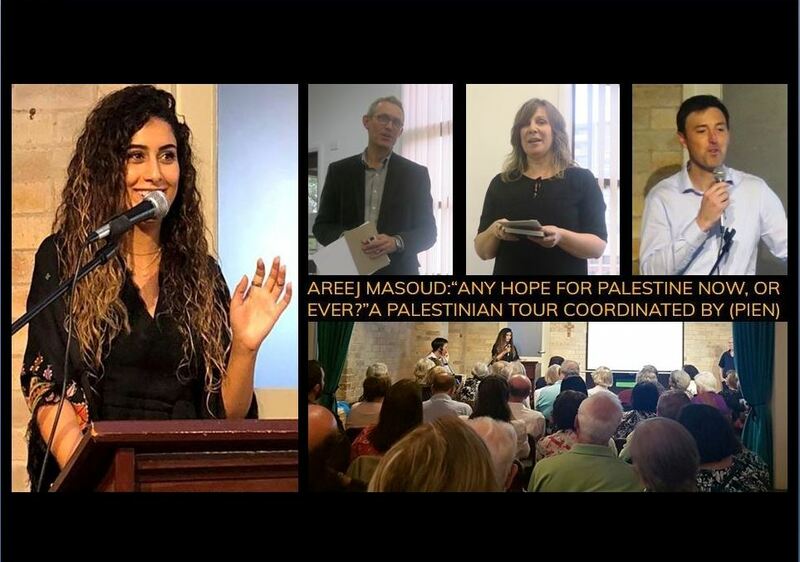 Areej obtained her qualifications in Theology and Psychology from Bethlehem University and accomplished her dissertation on Zionism and Kairos Palestine Document. Since then, she has become eager to speak on behalf of her people to tell the real story of occupied Palestine. Areej is an activist and a well-articulated passionate speaker who longs to reach out to the world to talk about the reality of the bitter situation of Palestinians that is hidden from the mainstream media. Areej has recently been on numerous speaking tours affiliated with churches and International peacemaking organizations. She has recently traveled to Australia where her speaking tour was organized by an act of the Palestine Israel Ecumenical Network (PIEN). The primary mission of PIEN is to raise the awareness of people that Australian Christians are seeking lasting peace and justice for the people of Palestine and Israel. It held nationally a full program around the major cities of the Australian interstates such as Perth, Bendigo, Newcastle, Brisbane, Melbourne, Sydney, and in Canberra, the capital city, and others. In Sydney, I had the opportunity to attend twice Areej’s public lecture titled “Any hope for Palestine now, or ever?” and to hear her insightful talk sharing her stories with Australians. 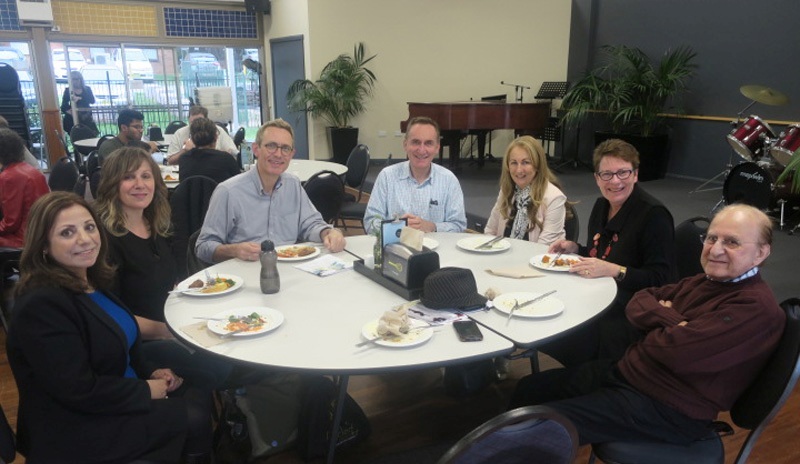 The lecture was held in Sydney on Wednesday 24th October 2018, at the Tinsley Institute, Morling Colledge, Macquarie Park and followed by dinner. Pastor Darrell Jackson, the Associate Professor of Missiology, and Senior Lecturer at Morling College at the University of Divinity and Australian College of Theology; made a concise introduction about the Palestinian issue, said an opening prayer and hosted the event. Areej Masoud Areej spoke on the subject of the current situation of Palestine accompanied by slides, she made an insightful speech on behalf of her Palestinian people revealing to the world her actual reality of the current political situation; often concealed from mainstream media. A reality of the ongoing tension where access to basic necessities such as health care, education, water, shelter, freedom of movement and economic security is greatly restricted. This dehumanizing plight which facing Palestinian Christians is a major issue. “The conflict is not a conflict of different faiths; it is about the aggression of the Palestinian people suffering the occupation and the loss of their land,” …“According to Christian theologians; The Israeli occupation has a political, cultural and educational impact on Christian Palestinians; Christians suffer the same injustice as all Palestinians leading to a high number of Christians’ migration.” Areej said. Then she spoke about the meaning of Hope, quoting: “Hope is the capacity to see God in the midst of trouble.” Rev. Dr. Yohanna Katanacho – Bethlehem Bible College. “God did his part, the ball is in the court of humankind that transformed faithful are to engage the word challenge the monopoly of power and live the life of an already liberated people.” Rev.Mitri Raheb, President, Dar al-Kalima (The House of the Word) University College in Bethlehem. Areej asked the audience to spread the word by telling people to come to meet Christian Palestinians, to learn and to share their stories. Areej’s presentation was followed up with a Question and Answer period where the session went smoother and followed by dinner. 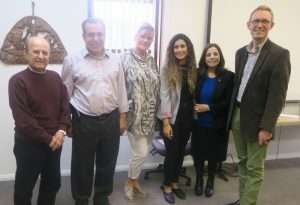 Nell Potter, Artist, and Manager at Palestine Israel Ecumenical Network (PIEN) spoke about the painful situation of Palestine which she visited recently. She also gave a brief talk about PIEN’s mission, aims, and goals and made a specific announcement about the available various informational flyers to be handed out to Australian people, and urged the audience to read them and to distribute them to others. For those flyers are designed and intended to raise the general awareness of the Palestinian cause and to get the word out. 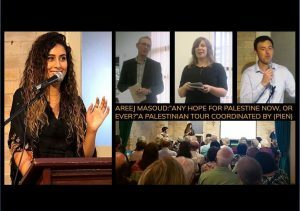 On Saturday night 27 October 2018, it was wonderful to see Areej again when she gave her last presentation on her PIEN speaker tour at Balmain Uniting Church where Pastor Stewart Mills hosted the event, and Palestinian food was served. 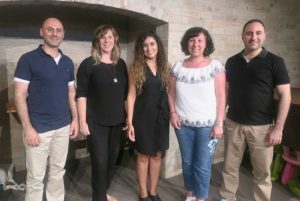 It is worth mentioning here that all the audience were Australians, and a few Australian Palestinian people; including Dr. Mahmoud Abu Arab and his family, Suzan Wahhab and her family. The attendees were involved in the discussion showing full support and empathy with the Palestinian people, promising to help them and wishing them peace with justice. It is fitting to pay tribute here to the wonderful work done by both the members of PIEN network in Australia and the visiting speaker from Palestine, Areej Masoud, as she proved to be a young Palestinian woman who speaks courageously and tactfully. Areej traveled to many parts of the world and Australia and talked about the story of her occupied Palestine. Her conversation was very impressive as she touched so many people’s hearts and minds. Congratulations to the Palestinian struggler young woman Areej, and thanks for her invaluable efforts, which will always be a guiding light in the hearts of Australians.